Lean-Agile Product Management is a key part of Business Agility: the quick realization of value predictably, sustainably and with high quality. It is primarily focused on the agile Business Discovery of value to turn goals and objectives into appropriately defined and scoped requirements of those aspects of a system being built. These higher level, but well scoped and defined requirements feed business delivery by providing thinly sliced segments that can be quickly developed, providing quick feedback and the ability to pivot. Product management therefore holds business owners as its primary customers and guides business delivery to meet the expectations of its customers. The value stream is the workflow and process starting from the identification and selection of “value opportunity” through the realization of the value. Product management is a business responsibility in the value stream and is executed by the role of Product Manager. The product (or the service being provided) directly relates to the technology deliverable and/or functionality in identifying how to achieve the value of the opportunity. Providing a view of all of the capabilities required to actually realize value and not just get it deployed. Providing teams with a well refined backlog. 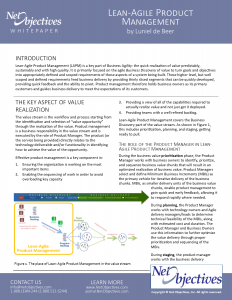 Lean-Agile Product Management covers the Business Discovery part of the value stream. As shown in Figure 1, this includes prioritization, planning, and staging, getting ready to pull. During the business value prioritization phase, the Product Manager works with business owners to identify, prioritize, and sequence business value chunks that will result in an optimized realization of business value. Product Managers select and define Minimum Business Increments (MBIs) as the primary vehicle for iterative delivery of the business chunks. MBIs, as smaller delivery units of the business value chunks, enable product management to gain quick and early feedback, allowing it to respond rapidly where needed. During planning, the Product Manager works with technology owners and Agile delivery managers/leads to determine technical feasibility of the MBIs, along with estimated cost and duration. The Product Manager and Business Owners use this information to further optimize the value delivery through proper prioritization and sequencing of the MBIs. Once ready to pull into business delivery and for the remainder thereof, the Product Manager functions as the primary business delivery stakeholder of the MBI and its features. The Product Manager continues to provide product and business input and make any necessary product decisions based on additional discovery and feedback gained throughout development and deployment. The Product Manager remains responsible for the business value realization of the MBI after deployment, reacting to feedback and supporting the resulting asset. The Product Manager is therefore responsible for enabling agility both in Business Discovery and Business Delivery. 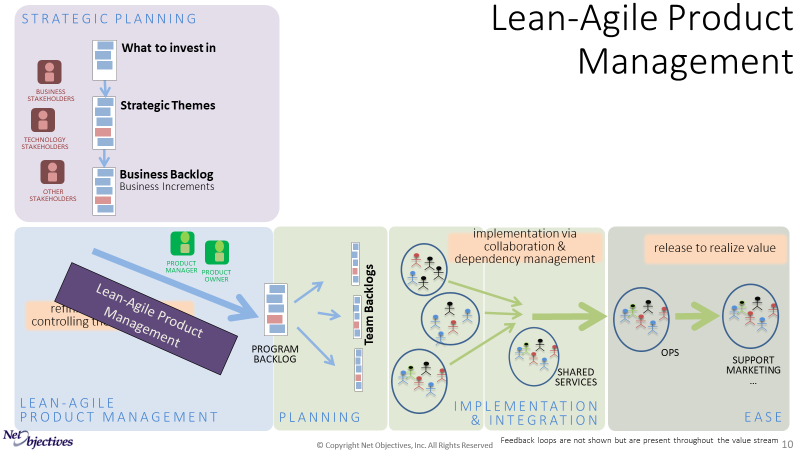 No matter how “agile” business delivery attempts to be, it can only result in true business agility when supported by Lean-Agile Product Management. The best way to learn more is to watch the videos at our Agile Product Management Essentials online course.